We have supplied seven Dr. Cars to the Republic of Sudan. 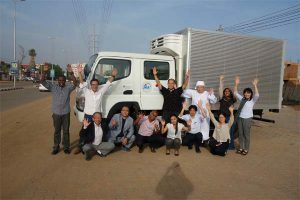 In JICA projects which we participate with Axio helix, Inc. , delivered seven Doctor cars in Republic of Sudan. These vehicles collaboration with the Sudanese Ministry of Health visit remote areas,where has not enough of medical facilities, takes an active part in the initial care in the medical forefront. By this activity, it is expected to contribute significantly to mortality improvement of maternal and newborn that is a common problem in developing countries, including Africa.